Trick or Treat: Or, should we say Trick the Treats! Happy Halloween! I bet you’re expecting a blog all about how horrible candy is and that you should help your kids avoid it this Halloween at all costs. But, man have we got a surprise for you! The reality is that sugary junk foods like candy exist in the real world! Your kids have access to it at school, at friend’s houses and for many of you, even in your own home. Just like everything else, the trick is to teach your kids how to enjoy their treats responsibly. For many kids, simply heading out for an evening of trick or treating with a tummy full of nutritious, filling foods will help them make better decisions and not overeat all of the sweet treats they receive. Here are a few simple & fun ideas to help you fill your family up before you head out for a night of Halloween fun! Turkey Mummy’s: Slice your mummy wrap (square wonton wrappers) in to strips. 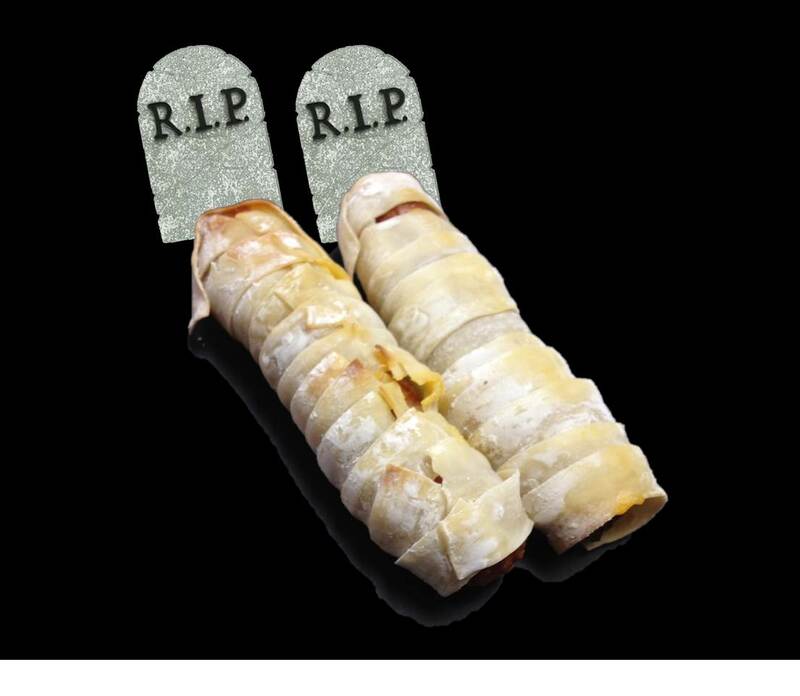 Then, wrap the strips around your mummy (a turkey hot dog) and bake. 350° for 20 minutes should do the trick! 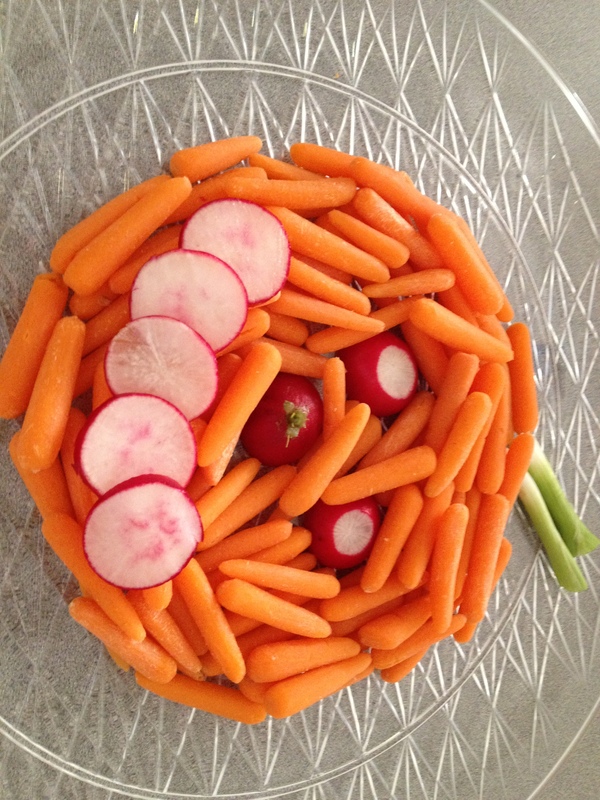 Pumpkin Veggie Tray: Simply fill a plate with any vegetables of your choice and use them to make a pumpkin outline. Your kids will think its fun to make and then enjoy snacking on it too! Pumpkin Krispies: Prepare your crispy rice treats the way you’ve always done it. But, add orange food coloring once your marshmallows have melted. After you’ve mixed in your crispies, set the mixture out on parchment paper in ‘blobs’ to let it cool. When it has cooled, but not quite set, form the blobs in to a pumpkin shape and add your features. We used chocolate chunks for the eyes and nose, almond slivers and white pearl candy for the mouth and Twizzlers for the stem. But, you can use your favorite treats to decorate your pumpkins. Strawberry Ghosts: A Halloween twist on an old favorite. Using white dipping chocolate, give your strawberries a ghostly cloak, then decorate their faces using chocolate decorators icing.